April 5, 2019, 8:07 p.m. 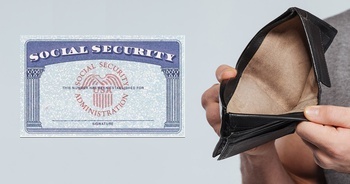 Many Americans are doubtful of ever getting their Social Security benefits. They have good reason to be worried. The system pays out more than it takes in. It is already running a deficit and is on schedule to be depleted in 2034. We explore what might happen in this post. In 1935 President Franklin D. Roosevelt signed the Social Security Act. In 1937 the first Social Security tax was implemented. This required workers and employers to pay 1% of the first $3,000 in wages or salary ($52,376 in today’s dollars). The program was developed for workers to earn benefits by paying into the system during their working years and then draw on it when they retire or if they become disabled. When it was created, I doubt anybody wondered if social security would ever go bankrupt. Over the years as costs increased, lawmakers did raise taxes to help it stay afloat. As of 2019 the tax has grown to 12.4% (split equally between the employee and the employer) on the first $132,900 of income. The program’s financial security is solid when the ratio of workers to retirees high (more people paying in than those taking out). In the early years of the program the ratio of workers to retirees was high so the trust fund’s balance grew. The ratio hovered above 3 workers per retiree until about 2010. Now the situation is flipped, and it is getting worse as baby boomers begin to retire. The projected ratio going forward is only 2.2 workers per retiree. This imbalance has many people afraid of what will happen. The number of new workers entering the system is in decline because the birth rate has dropped and although immigration has increased, going forward population growth is expected to be low. On the retiree side, improvements in medicine and health care are keeping people alive longer so there are more retirees drawing benefits for a longer length of time. The Social Security program has a trust fund that holds the excess contributions to the program. As a result of fewer workers and more retirees than projected the Social Security Administration states that the Trust Fund will run out by 2034. Being $14 trillion in the hole looks pretty bad, but as a percentage of GDP it isn't a lot to worry about. Thankfully as a percentage of GDP the cost is expected to level off, which is the real clincher for its long term viability. When the social security trust fund “runs out” that doesn’t mean today’s workers won’t receive benefits, it simply means they may receive less than they had anticipated, or the government will have to borrow to cover the difference, adding to the deficit. 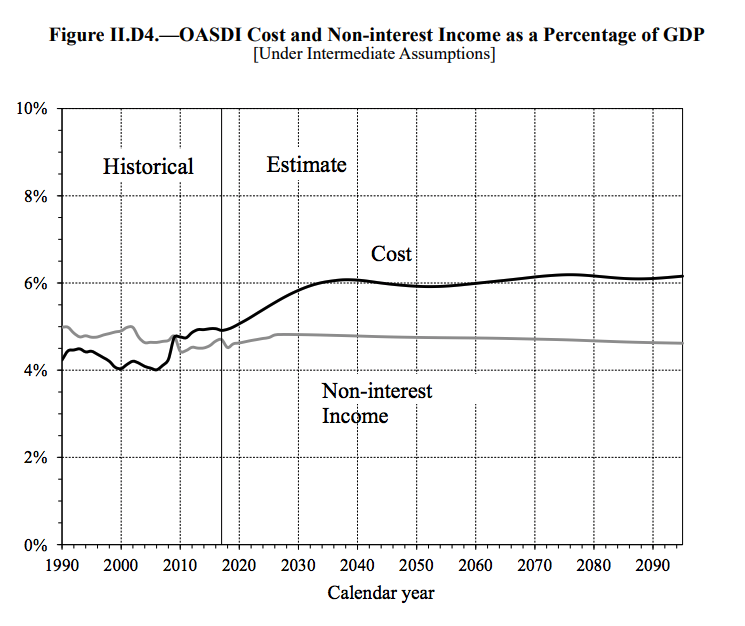 Social Security’s total cost is projected to exceed its total income (including interest) in 2018 for the first time since 1982.... until 2034 when the OASDI reserves will be depleted. Thereafter, scheduled tax income is projected to be sufficient to pay about three-quarters of scheduled benefits through the end of the projection period in 2092. 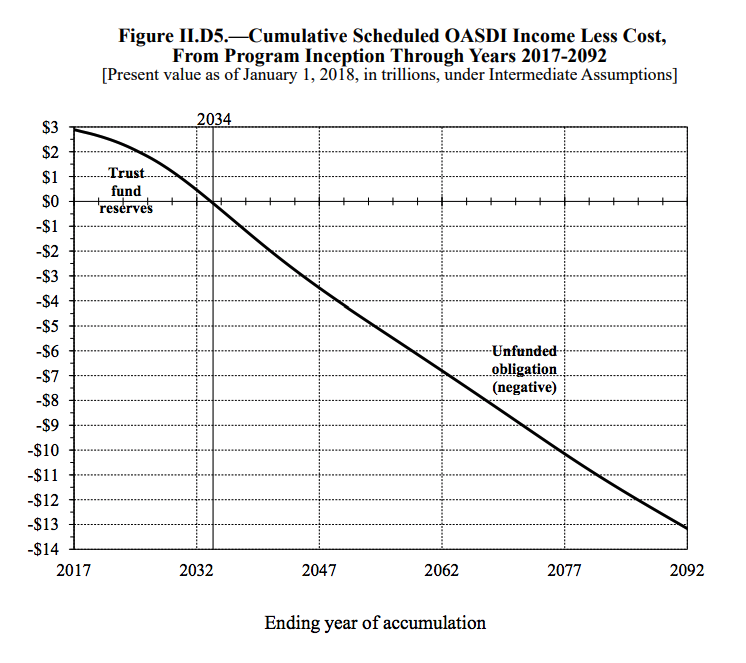 Worst case scenario (if no changes are made to the program by lawmakers) it is projected to pay three-quarters of scheduled benefits through the end of 2092. So a 25% haircut might be coming in the 2030’s or beyond, but that is if politicians do nothing. There are plenty of options such as raising taxes, increasing the retirement age, or reducing benefits in certain cases. Remember, Social Security is a social insurance program that millions of voters depend on to meet basic needs. It is a direct injection of cash into the economy every month. It also helps to stave off macro level financial disasters. Sure it wasn't designed for the long life expectancy we enjoy today. But it isn’t going to disappear or suddenly collapse. Chances are you will have a large portion of your Social Security benefit when you retire, if not all of it. Tips for maximizing your social security benefit. Social Security Administration - A Summary of the 2018 Annual Reports. 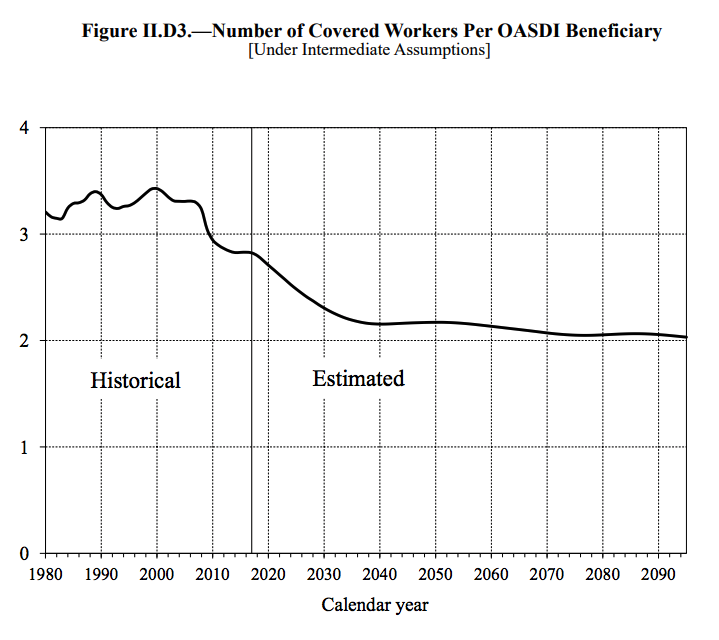 Social Security Administration - 2018 OASDI Annual Report (more detailed than previous link, includes link to PDF report).